Are you ready to censor and edit user comments? The Australian Advertising Standards Board (ASB) has pronounced that any business is not only liable for comments made by the business on Facebook, but also for any comments made by customers on the businesses Facebook pages. 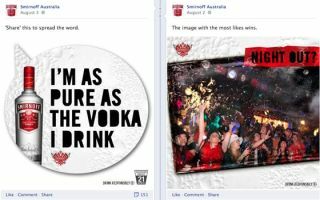 The case involved a complaint to the ASB about Smirnoff vodka's Australian Facebook page, which was accused of "violating standards with sexist, obscene Facebook content that also promoted underage drinking." Diageo, Smirnoff's parent company argued that Smirnoff's Facebook page was a networking tool for communication between company and customer and not a medium for advertising. However this was rejected by the ASB, who ruled that while the Facebook page didn't promote underage drinking, the Facebook pages did need to adhere to advertising industry codes, and the business was responsible for any user-generated comments that followed its own advertising messages. The consequences of this ruling are significant, John Swinson, a partner at Australian lawyers King & Wood Mallesons said "If, for example, a user claimed that Smirnoff vodka was the purest Russian vodka or it could lead to success with women, the company would be liable on multiple counts." Speaking to Techradar Phil Rothwell, Sales and Marketing Director at SellerDeck, commented on the ruling. "This is a bewildering decision with potentially wide ranging implications. It seems to assert that comments posted by customers on a fanzine site are, in essence, advertising. "People don't have an innate right to say what they want without consequence, but describing Smirnoff as 'Russian vodka' is some way off deriding people with malicious intent. I can understand why Russian distillers find it irritating, but this response is over the top and potentially counterproductive. "The end result isn't going to help anyone. We can't expect the general public to be 100 per cent accurate on postings and expecting them to adhere to advertising rules is ridiculous. Are Australian diners going to be barred from offering 'English Breakfasts'? It's the stuff of nonsense." While the ruling applies to just Australia, the law may be used as a model elsewhere in the World.